Shire Barnsdale Log Cabin is an extremely versatile log cabin with a stylish design. Available in 3 different sizes (7x7 / 8x8 / 9x9), all with ridge heights of under 2.5m, the Shire Barnsdale is suitable for a wide variety of uses. 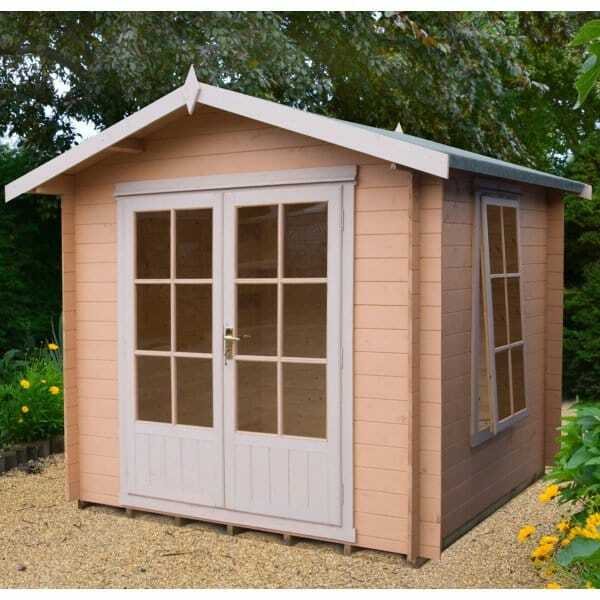 Featuring a Georgian style opening window, the Shire Barnsdale will make a stylish yet practical feature in your garden. In common with most Log Cabins this Log Cabin is Delivered untreated and will therefore need an application of a good quality timber preservative as soon as possible. Review - I have now put together my log cabin. Excellent kit, timber engineering is excellent. Everything included all fittings nails etc etc looks very nice and quality. Took a long timer for me to treat with Cuprinol 5 star wood preservative. An option of the whole summerhouse being dip treated before delivery would be very good. I have now put together my log cabin. Excellent kit, timber engineering is excellent. Everything included all fittings nails etc etc looks very nice and quality. Took a long timer for me to treat with Cuprinol 5 star wood preservative. An option of the whole summerhouse being dip treated before delivery would be very good.